I Am Setsuna is an active turn-based RPG that absolutely thrives on your nostalgia for old school games. You take the role of Endir, a mercenary who has been assigned a mission to go assassinate the sacrifice, Setsuna. After learning that she must die regardless of if he assassinates her, he joins in on her pilgrimage to the Last Lands. Along the way they will meet many a friend and foe, and the perils they face will put the pilgrimage in jeopardy. Regardless, they must make their way through the ever-falling snow in order to make it to the end of their journey. I Am Setsuna really is a game that will feed off of your nostalgia for the older games. The combat plays out in an active turn-based style, very similar to how Chrono Trigger played out. As your character’s turns come up you can either choose to attack immediately or wait for your character to gain some Momentum. Alongside the regular ATB bar you will see another gauge build up. This gauge fills whenever your character takes a turn, is damaged, or will fill overtime when their ATB is full. When the gauge makes it to the top you will gain Momentum, and you can have up to 3 Momentum stacks at once. The Momentum system gives you an interesting dilemma – do you hold your turns in order to gain the bonuses that Momentum can provide, or do you just go all out and not wait? The answer is that you’ll need to do a balance of both. While the regular enemies may not prove to be much of a challenge, the bosses will. Momentum can help give you the upper edge, making your moves (Techs) become even more useful. Some skills will gain extra damage through Momentum, while others such as buffs will gain an extended duration or the ability to hit all party members. To use your Momentum – one stack per turn – you need to press the Square button when a blue light flashes over your character’s head. While it may take some time to get used to, it’s fairly easy to get a hang of, though I still found myself missing it occasionally near the end of the game. 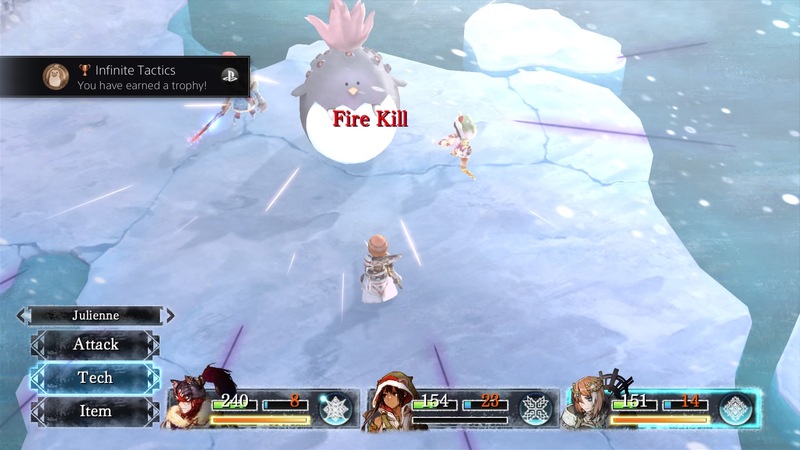 Pulling from it’s Chrono Trigger inspirations, I Am Setsuna also features a combo system. When two party members who have a combo skill both have their turn ready, you’ll be able to unleash their combo skill. These skills combine the two moves together to create one powerful skill. One thing that I found much more confusing to figure out was trying to determine what I actually needed to get these going. While Chrono Trigger just had you learning all of your skills as you leveled, I Am Setsuna goes a completely different direction for learning these skills. 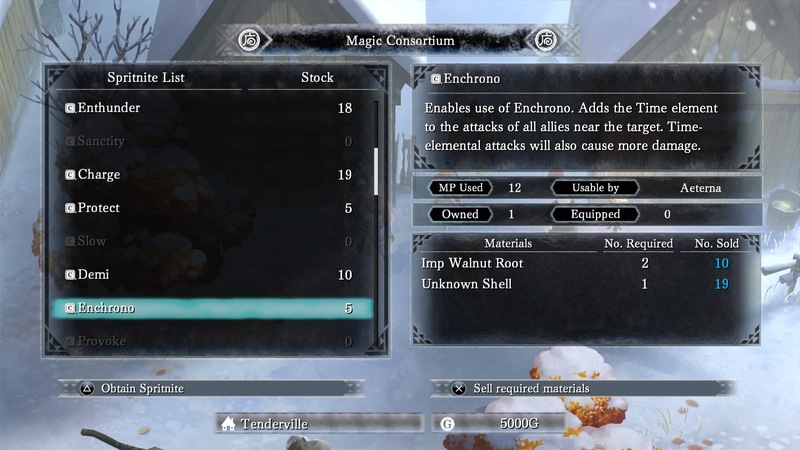 In order to learn skills in I Am Setsuna, you will first need to get drops off of the enemies you battle. Simple enough, at least until you find out that enemies can drop different (and additional) items depending on the method in which you kill them. For example, a regular kill of an enemy will give you their “normal” drop, but if you also kill them with (roughly) exact damage and with a Momentum enhanced skill, they’ll now also drop two additional items! Once you have these drops in hand, you will need to find someone from the Magic Consortium who is located within each city. After finding this NPC, you then need to sell the drops you got. Once you have all the materials needed to create the particular Spritnite for that skill, you can then buy it (thankfully it is free). Simply having the Spritnite in your inventory isn’t enough though, you need to actually equip it. Each character has a limited number of slots for Spritnite, and the number they can equip is determined by their current level and what talisman (accessory) they have equipped. Now that you finally have your Spritnite on, you can now do fancy combo skills should you have the right skills with the right party members! Enemies within the world of I Am Setsuna don’t drop any money. Instead, the majority of your income will come from the materials you sell to the Magic Consortium guy. This money will be used to purchase food (once you’ve obtained the recipes), weapons, talismans, and usable items. You won’t need to spend any money on inns in the game due to the fact that there are no inns in the game. While Tents are fairly cheap, I hardly found I needed to even use them. In most cases, I found that the healing I got from leveling up was enough to get me through the areas and bosses. 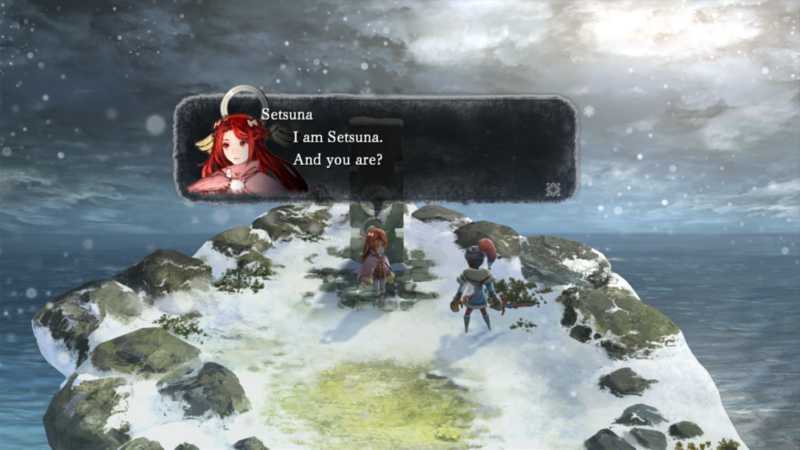 Like many other elements in I Am Setsuna, the graphics of the game harken back to the old school games, but at the same time they stay modern. 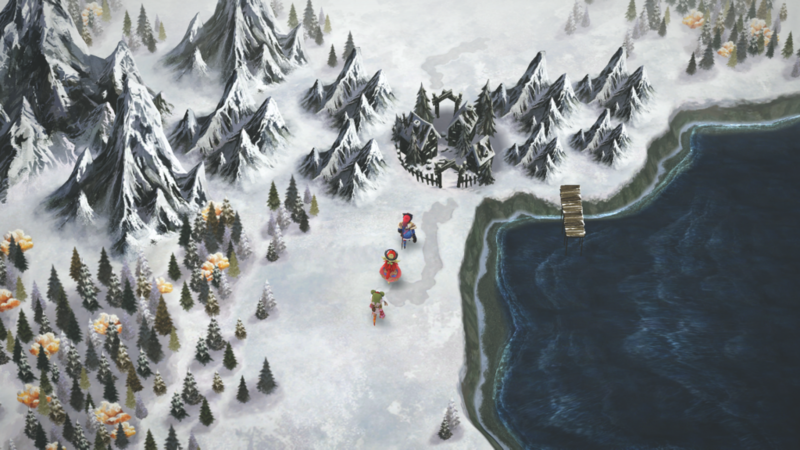 Featuring a world map that is extremely similar to that of Chrono Trigger’s, I am Setsuna will have you traversing over the snow covered world with small models that look somewhat similar to what was used for the remakes of FF3 and FF4. Speaking of the snow, the effect your characters have on the snow is yet another part of the game that is wonderfully done. As you (or your enemies) move through the snow, you’ll leave a trail behind you that slowly fills back up overtime. It’s just a small touch, but it’s a small touch that I find to just be fantastic. The music in I Am Setsuna is also absolutely wonderful. Pretty much completely done within piano, the tunes will leave you feeling calm and relaxed as you travel through the various dungeons and towns. As someone who loves piano versions of songs, this made me just fall in love with this soundtrack even more. As far as voice acting goes, what voice acting exists is very minimal – only present within battles – and is only in Japanese. While I typically prefer to play my games with an English voice over if possible, I didn’t mind the fact that this was in Japanese since it was only there in battles. I Am Setsuna pulls on a player’s nostalgia for old school games and absolutely nails it. The combat system is incredibly fluid, and the Momentum system will leave you strategizing your next move at all times. The story is incredibly solid, and the soundtrack and graphical style are incredible. I thoroughly enjoyed my entire time playing I Am Setsuna, and was a bit sad to see the credits start to roll across the screen. To anyone who loved SNES era of RPGs, I Am Setsuna should be an instant purchase for you. Even if you haven’t really played through many old school RPGs, the game is still a wonderful dip into that style. The game is an extremely high recommendation from me, and may just be one of the best games I’ve played in years. I Am Setsuna is available now for PS4 via Amazon (Digital) and PSN, and through Steam. I would like to thank Square Enix for providing me with a code for review purposes.